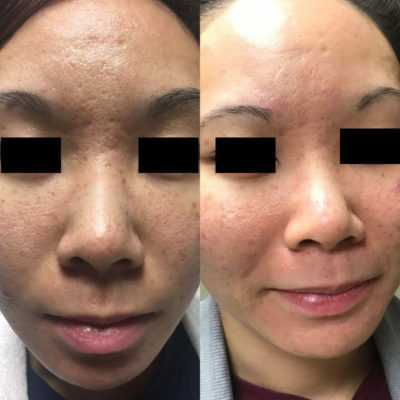 Micro needling (also known Derma Pen) induces collagen and is a minimally invasive, non surgical and non ablative procedure for skin rejuvenation. This revolutionary technology involves a treatment whereby a device with small needles is pushed over your face and neck area to create controlled punctures, which force your skin into repair mode. This healing process continues weeks after the treatment. Ideal for acne scars, stretch marks, fine lines and overall rejuvenation for the skin. The Derma pen is an FDA approved device that is proven to be less uncomfortable, with minimal to no downtime and provides greater results than a roller device. The added advantage of the pen is that the depth of the needle penetration can be altered during treatment. The tip of the pen is small, allowing it to pass closer to the eyes and nose for a more effective treatment in these areas that are of concern to many patients. So those with a fear of needles shouldn’t discard this technique straight away, as the microneedle length can vary from 0.5 to 3.0 mm, which is incredibly tiny compared to a traditional needle. Also before the micro needling the face is anesthetized. So you feel nothing. The number of treatments depends on each individual skin condition, but usually patients are looking at 3-6 treatments. Treatments are performed approximately every 4 weeks. Recommended maintenance treatments every 6-9 months. Individual assessment will determine your course of treatment. So book your free skin analysis today at Redeem Medispa! Come in for a free no obligation assessment to learn more about Micro needling treatments and if you are the right candidate to receive Micro needling.